Since Paris is by far one of the globe's most photogenic cities, it's not surprising that the dusky hours here are strikingly beautiful, especially in certain areas. Sunset is a wonderful time to stroll around the city, either alone, lost in thought and contemplation, or with friends, taking in the breathtaking landscapes made all the more dramatic by dusky light. Whether it's a romantic walk or a solitary amble you're after, here are 10 of the most beautiful places to take in the sunset hour. There's a good reason why so many artists, from the Impressionists to the Expressionists, have chosen the Seine River as a subject for their paintings. The Paris riversides, or quais in French, afford some fantastic scenery, and at dusk, the light is particularly haunting. 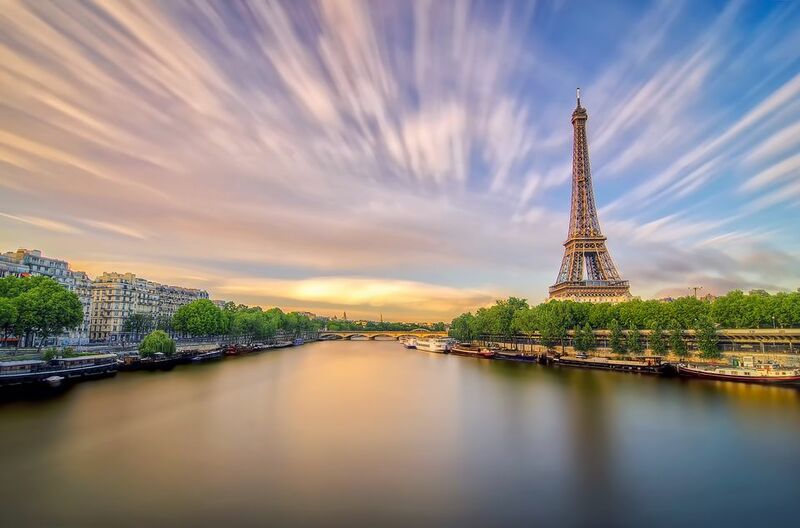 So whether you elect to take a stroll on the left bank or the right bank, charter a sunset boat tour of the Seine, or set up a picnic on the island known as the Ile St Louis, few places in the French capital are as perfect for reveling in the dusky hours than along the city's riverbanks. 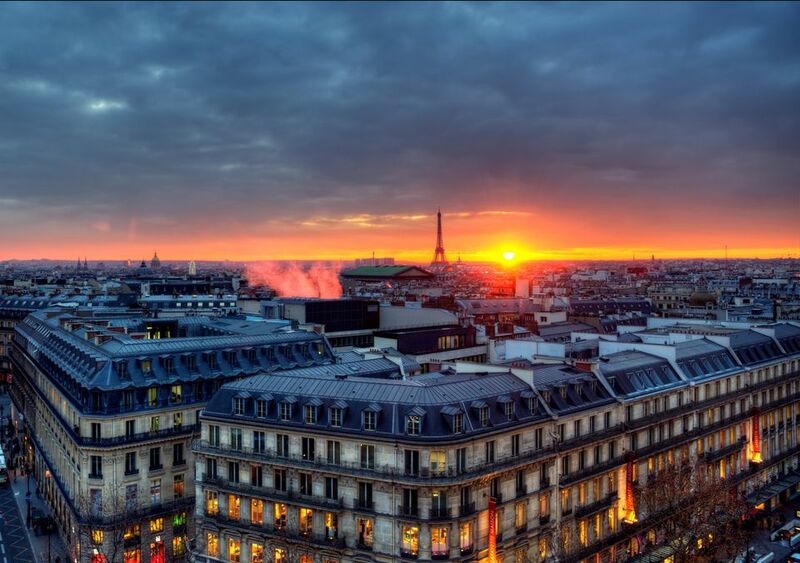 The iconic Notre-Dame Cathedral, especially at sunset, will make your heart flutter a bit. There's something enduringly awe-inspiring about the 12th-century Gothic cathedral, not least because it's an astonishing feat of human achievement even by today's standards. Paris may be a modern metropolis, but witnessing the dramatic spires and towers of Notre Dame glowing against the dusky sky whisks us back in time, to a medieval Paris that's never entirely gone away. Paris counts many ornate and lovely parks and gardens within the city limits. But for us, the Jardin du Luxembourg remains my favorite spot for a sunset stroll-- with the Tuileries running a close second. Especially during the autumn months, a walk at dusk in these formal gardens affords stunning skies filled with an especially pearly sort of light​ and combined with the crisp fall air, it's the perfect way to clear your mind and invite in some inspiration. Countless famous writers have done the same. Also in the Latin Quarter, and just across the street from the Jardin du Luxembourg, the Place du Panthéon is another unbeatable spot for sunset views over the city. On a clear night, you might see Notre-Dame Cathedral's towers and spires, and many other landmarks, from the hilly vantage point outside the historic mausoleum, dedicated to the great minds of France. Nearby: The Place de la Sorbonne, outside the iconic university, is another beautiful spot at dusk. Enjoy a drink on one of the terraces lining the square. Next up in the inventory of ideal dusk-hour spots is the rooftop of the Centre Georges Pompidou. While accessing the top-floor viewing area does require a ticket to the onsite National Museum of Modern Art, or a reservation at Georges, the onsite restaurant, it's well worth the panoramic views over Paris. The Centre Pompidou lies right at the boundary of the old right-bank neighborhood known as the Marais, a cosmopolitan area that's coveted by fashionistas and hipsters but also has historic roots as a Jewish neighborhood and, more recently, a gay-friendly one. As a result, a feeling of old Paris is still very much alive here. Gorgeous old hotels particuliers (private mansions), Renaissance and medieval-era houses are especially otherworldly at dusk when the light hits them in a way that reminds you: This can only be Paris. Heading sharply northward from the old Marais, another neighborhood that affords some of the most memorable sunsets is hilly, throwback Montmartre. Sure, going to take in the panoramic views from outside the Sacré Coeur is a fine thing to do. It also happens to be very crowded in that particular spot. Explore the tiny, winding little streets behind the famed old basilica, including Rue de l'Abreuvoir and Rue des Saules, for a sunset-hour walk you won't soon forget. Stop and have a drink on a terrace in the summer, then take in an old cabaret show somewhere nearby. The tourists don't venture back here in quite the same swarms, so it's generally fairly peaceful. A preferred haunt of young, in-the-know Parisians, the banks of the Canal St Martin and, further northeastward, the Bassin de la Villette, are fantastic places to stroll at dusk. Take a leisurely walk around sunset along the banks of the canals, from metro République or Louis-Blanc up toward Jaures or Stalingrad (a map will be essential), before ducking into one of the area's many cool bars and restaurants for drinks and/or dinner. Designed by renowned architect Jean Nouvel, the Institut du Monde Arabe (Institute of the Arabic World) has one of the nicest rooftop terraces for viewing the city. It's well worth the detour-- especially if you enjoy a good, strong cup of traditional mint tea. Last but certainly not least, and heading firmly westward for once, the Esplanade du Trocadero at the exposition space known as the Palais de Chaillot is another fantastic spot for dusky views over Paris. As you can see from the photo, the esplanade is famous for its straight-on views of the Eiffel Tower.